II cl. (Parentage unknown) Raiser unknown, pre-1980 N:1990 &Reg:1993: D.Dale I: Parkland Perennials, 1994. 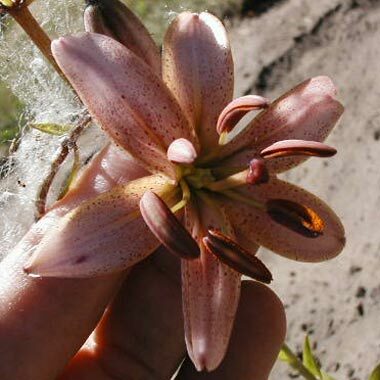 Inside cream, suffused pink and with a cream throat; outside cream, overlaid pink and with deep pink midribs; very few, maroon spots randomly distributed over inner part of each petal; nectaries cream; pollen golden. Fls 90mm wide; petals 37 x 20mm, not ruffled, tips slightly recurved. Lvs whorled, 146 x 55mm, mid green. Stems 1.7m, appearing plum-coloured, with 18-24 fls. Early July.